Did You Know That October is Chiropractic Health Month! 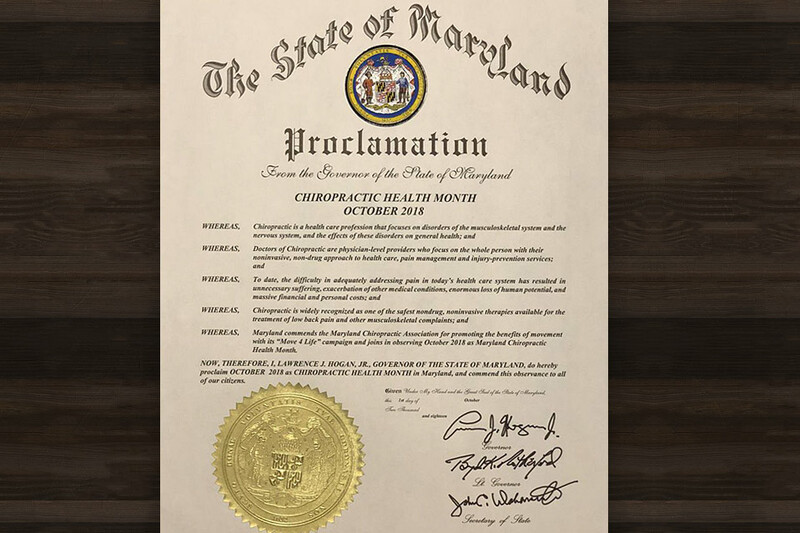 Governor Larry Hogan has proclaimed that October 2018 is Chiropractic Health Month in Maryland! You know the expression – Move It Or Lose It. Many of us know that we should eat healthy and exercise but have a hard time getting our recommended dosage of fruits, veggies and exercise in. This is evident through staggering numbers of millions of people suffering from chronic illness and diseases contributing to record high insurance premiums and over-prescribed narcotics leading to opioid addictions. As advocates of chiropractic care we were excited to learn of the recent proclamation. Chiropractic care offers a noninvasive treatment that can help people find relief; more so when combined with an active and healthy lifestyle. Chiropractic care benefits include pain relief without medication, reduction of inflammation, restoration of mobility and range of motion. We encourage you to take care of yourself now, to enjoy your golden years later. If you have been injured, The Pinder Plotkin Legal Team can help you recover compensation for your injuries, including compensation for physical therapy and chiropractic care. Please call us today at (410) 661-9440 or online.